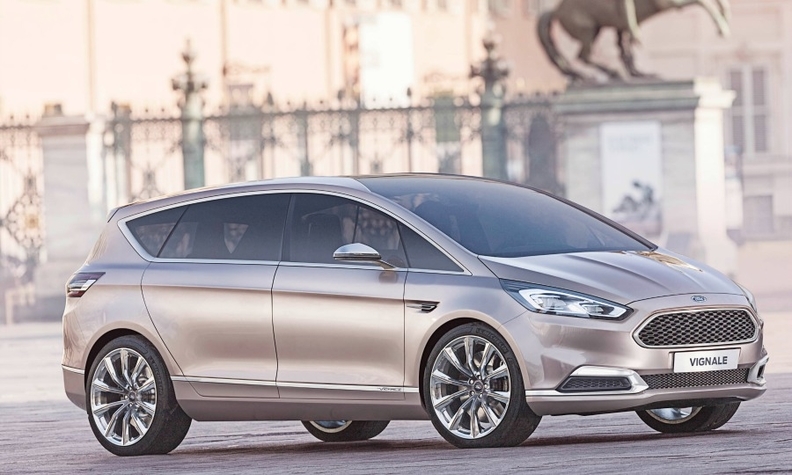 Ford says models such as the Vignale variant of the S-Max, shown, will appeal to buyers seeking higher levels of specification and customer service. COLOGNE, Germany (Reuters) -- Ford Motor Co. intends to compete for customers with premium carmakers as it offers high-end versions of its mass-market models in a bid to end years of losses in Europe. At the company's European headquarters, executives are confident they can convince drivers to pay more for existing models upgraded with leather interiors, chrome moldings and top-notch customer service packaged under a new label, Vignale. But with most of its rivals chasing the same affluent buyers, the tactic is fraught with risk and there may be few winners. "I doubt that mass-market manufacturers are able to generate considerable volume in the premium segment," said Boston Consulting Group senior partner Nikolaus Lang. "Penetrating the European premium market is troublesome." Fiat Chrysler Automobiles CEO Sergio Marchionne, who himself is expanding his automaker’s Alfa Romeo and Maserati brands in an effort to increase profit margins, is also skeptical of moves to take mainstream brands upmarket. "Those brands that are between a mass-market and a premium brand don't have legs," the executive told investors on May 6. Success with the move could help Ford achieve durable profitability in Europe, which is emerging from six years of slumping sales. The carmaker has not made money in the region since 2010. Ford's European sales could soar by 25 percent to 1.65 million cars by 2020, according to research firm IHS Automotive, as it churns out at least 25 new or upgraded models by 2017. That, however, may count for little if it cannot raise prices. Through April, Ford's European market share has bounced back to 7.5 percent from 7.2 percent, as the automaker sold 11 percent more vehicles in Europe in the period compared with last year, according to data from industry association ACEA. But this was likely due to the bigger discounts offered by the automaker than its rivals. "Prices are still as competitive as they were in the worst of times," Ford of Europe sales chief Roelant de Waard said. The automaker has spent years searching for a premium formula that works in Europe's fiercely competitive car market, a process that saw it take on and later jettison European luxury carmakers Volvo and Jaguar. This time it is focusing on its own brand as it targets more affluent Ford buyers and drivers considering their first purchase of a high-end car. It also has customers of German premium brands BMW, Audi and Mercedes-Benz in its sights. "People assume it would be very hard to sell to them but that's not the case," de Waard told Reuters, pointing out that one in six owners of Ford's S-Max previously drove a German luxury car. Ford will also start selling its iconic Mustang sports car in Europe in 2015 and does not rule out introducing the upscale Lincoln brand at a later stage. Ford of Europe CEO Stephen Odell said the carmaker was on track to return to profit in 2015, but the brand needs to develop further. "It's a big risk if you assume that you can't do anything," he told Reuters at the company's regional headquarters in Cologne. "If you assume that all you're going to do is be squeezed, then it's a problem." Ford is not alone in its upscale ambitions. French rival PSA/Peugeot-Citroen is more advanced in launching its DS marque, which CEO Carlos Tavares plans to separate from the Citroen brand. Renault will debut the new Initiale Paris high-end line with the next-generation Espace minivan after offering a concept version at last September's Frankfurt auto show. Meanwhile, those high-volume carmakers are also being squeezed in a downmarket expansion by luxury rivals, with a push into compact cars by Daimler's Mercedes-Benz and Audi. Ford, however, believes the Vignale label can enhance the appeal of cars such as the Mondeo mid-sized sedan and the S-Max large minivan as it overhauls its European model lineup. A revamped Mondeo is expected by the end of 2014. The strategy is intertwined with a goal to increase Ford's share of sales to retail and company-fleet buyers, who typically order cars at higher prices, while curbing reliance on less profitable sales to rental-car companies -- even if that implies a loss of market share. To differentiate Vignales from cars produced on the same production lines as cheaper versions, Ford will set up special customer lounges at 500 of its 2,400 European dealerships. Those dealers will hold exclusive rights to sell Vignale-badged cars. Marketing strategy at Ford has shifted too, with company ending its sponsorship of UEFA Champions League soccer after 21 years. The league brought the brand to 300 million TV and online viewers in more than 200 countries, but its focus has shifted to business-minded, tech-focused buyers that it will seek out using digital media and sponsorship of technology fairs. "Ford doesn't need more awareness," said Odell. "We have to communicate the value of Ford."